Most important thing to watch next week from CNBC. At the end of Friday’s show the Fast Money team was asked what they would be focused on next week. Watch the video, we think they are spot on. 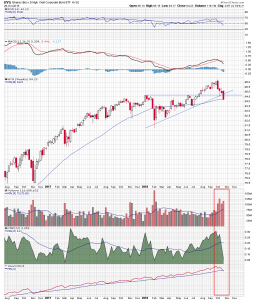 Below is a quick synopsis of their remarks and charts of the stocks and the index mentioned. Tim Seymour said he was watching the action in the US Dollar. He said a breakout above the $96.70 level would be dangerous for commodity prices and the economy. The dollar looks like it has already broken out of an inverse head and shoulders pattern on the weekly chart. The neckline is situated in the $95 area, and was broken first in August this year, and retested and broken a second time this month. This action formed a complex right shoulder. Further upside specifically through Seymour’s $96.70 resistance level, would confirm a head and shoulders base is in place. This would set the tone for the direction of the dollar over the longer term. Brian Kelly noted the complacency in the high yield bond market. He’s watching the iShares $ High Yield Corporate Bond ETF (HYG) chart. Its been moving higher for most of the year in opposition to government bond yields. “Beeks” thinks either the bond market or the stock market has things wrong. This week the HYG broke down through the uptrend line that has defined this year’s advance, and closed right on its 40 week moving average. Of note are the volume and money flow indications. Overall volume spiked considerably over the last four weeks, as the HYG started to trade lower. Chaikin money flow dropped sharply in that time, and the accumulation/distribution line has moved below its 21 period signal average. 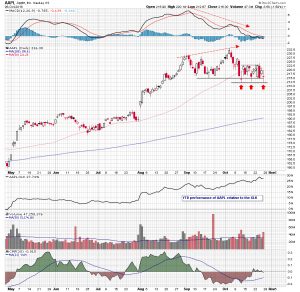 Steve Grasso highlighted the recent stable price action in Apple (APPL) shares. We’ve also noted how it has held up above the $215 level. 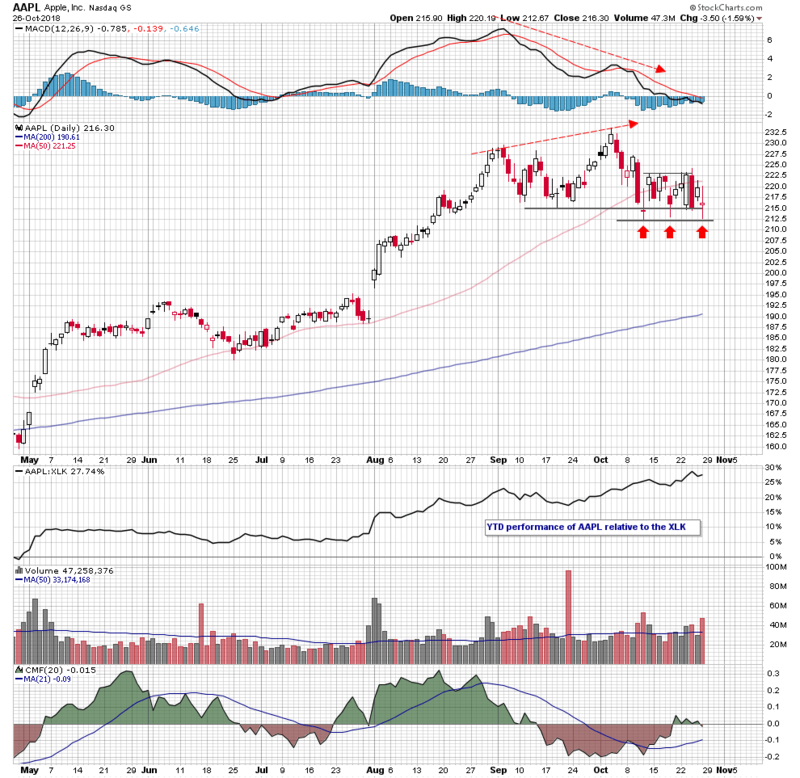 Now it looks like three long tailed candles have formed what could be a double bottom. 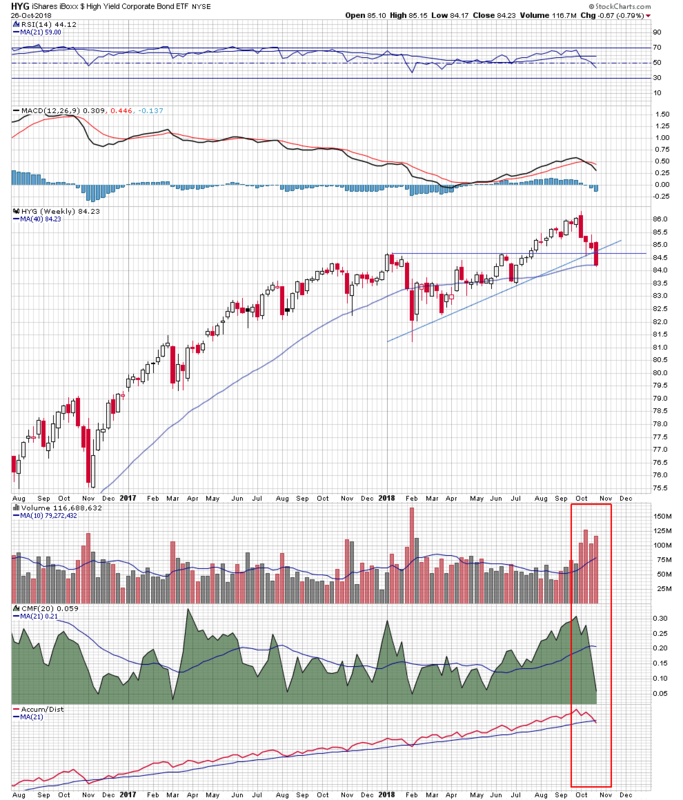 The weakness in the overall market began with cracks in the technology sector. Grasso believes that if Apple fades it would be the “death knell” for the overall market. Let’s call $212.50 support on the daily chart and $22.50 resistance. 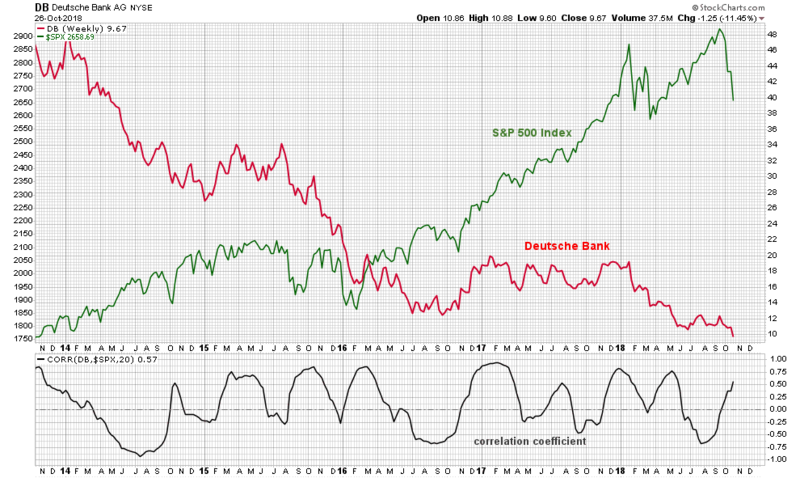 Finaly, Guy Adami repeated his read on Deutsche Bank (DB). He feels that European banks, particularly DB, have been telegraphing a message that the US markets are just now getting. He said to watch how DB trades next week as a further tell on our markets. 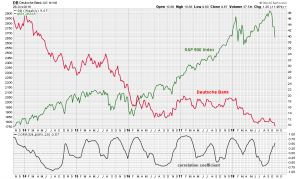 The weekly chart of Deutsche Bank relative to the S&P 500 Index hasn’t shown any real correlation until just recently, but its worth keeping an eye on.